The thickest tonkotsu broth you’ll ever have! It’s good, but very heavy and salty. You’ll enjoy the first few bites then feel sick after if you aren’t prepared…and yet it’s still good! While traveling through Japan, I wanted to try a lot of different food. For ramen, I wanted to try every type on tonkotsu ramen since that’s my favorite type. Any change I get, I’d visit Ichiran or Ippudo…and occasionally Tenkaippin. 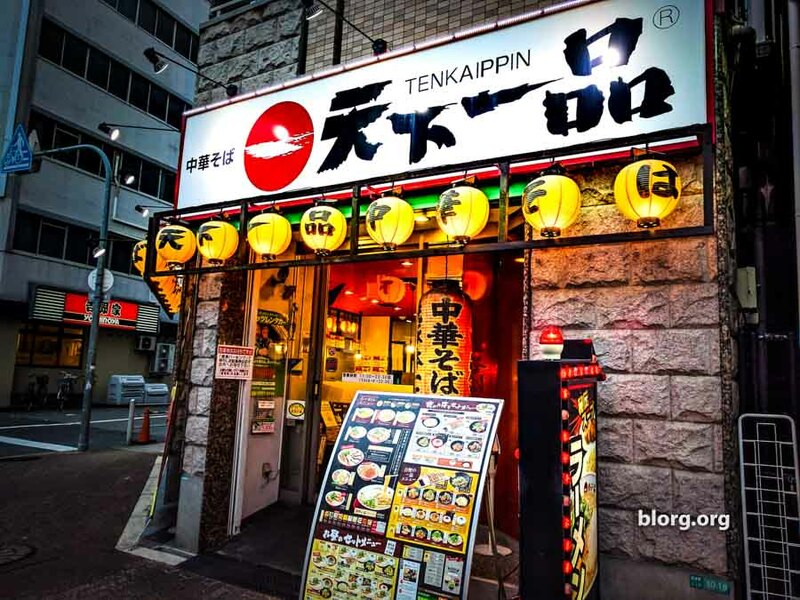 The pictures and review is from one of the Tenkaippin restaurants in Osaka. The restaurant is located a few blocks south of the very touristy Dotonbori area. I walked in one fine October afternoon, took a seat then looked at the menu. As you can see, the menu is completely in Japanese. I know enough Japanese to order from pictures and to ask for if an English menu is available. There was no English menu. The waitress didn’t speak English either. It’s cool I’ll wing it. I order the fanciest ramen on the menu. It’s 972JPY (1050JPY w/tax) as seen in the mid-left of the menu. The waitress then asks me a question in Japanese. I have no idea what she’s saying. She then takes a moment and says in English “strong, medium or weak?” Without hesitating, I say “Strong!” I’m just gonna go for it. The ramen arrived at the table and it was THICK! The broth was dense and viscous. I took a sip of the broth and thought to myself “Ohhhh….STRONG!” If you put this ramen in the fridge, it would turn into a brick of pork fat. I enjoyed the first few moments of the ramen because each bite was full of flavor. Then the flavor was overwhelming. It was also very salty. With this one bowl of ramen, I drank 10 tiny cups of water. You’ll typically get a tiny cup of water at Japanese restaurants with a pitcher/dispenser to refill your glasses on your own. The flavor became too much for me. There were a bunch of condiments/sauces on the table. All the labels were in Japanese. I just started picking them up and pouring them into the ramen. It was a science experiment to figure out which chemical could dilute this ramen into something more edible. I finished the ramen, but immediately felt sick. The only example of this feeling is when you don’t eat a fast food and then go nuts on a big mac combo. It’s tasty and satisfying on the way down, but you immediately feel sick after. I’m not sure if everyone gets that way, but that’s how I felt in the moment. As I was getting up to pay the bill there was a customer paying at the register. The cashier presented a mystery box in front of him. He reached into the box, pulled out a small ball and was disappointed. He put the ball back in the box. I went to pay my bill and the cashier presented me with the same box. It’s a good thing someone just did this so I knew what was going on. In any other situation I just would have politely declined if I didn’t know what was being offered. I reached into the box and pulled out a winner! The cashier clapped and congratulated me! Then presented me with a mini-ramen cell phone holder. Would I go here again? Absolutely. I just won’t get the strong ramen. ⟵Kirin Beer Factory Tour: Free Beer! Free Tour!